Vanilla is a flavoring fruit and the plant is a climbing orchid. It is cultivated mainly for its pleasant flavor. Indians were not aware of this plant until the Europeans introduced it to India. The Europeans used vanilla for flavoring their dishes such as puddings, cakes, ice creams etc which are popular in Europe. Later Indians started to use vanilla for flavoring the sweet dishes prepared in India such as Kheer. Vanilla is seen as pods or sticks in the plant. Vanilla is the second most expensive among the spices. There are various species of vanilla of which Vanilla planifolia is the one which is mainly harvested. The vanilla pods are harvested when they become pale yellow in color. The seeds are seen inside these pods. After harvesting, these beans have to be either cured or commercialized as such. There are mainly four steps in the curing process. They are killing, sweating, slow drying and conditioning. Killing is the process to stop the further growth of the vegetative tissue. It is done by sun killing, oven killing, killing by freezing etc. The beans are then wrapped in woolen cloth and kept in sunlight for some time. It is then kept in air tight containers. These beans are then dried to reduce any moisture content in it. Then these beans are stored for few months for developing the sweet fragrance. Finally they are sorted and graded based on the quality. Vanilla is the most commonly used food flavors. 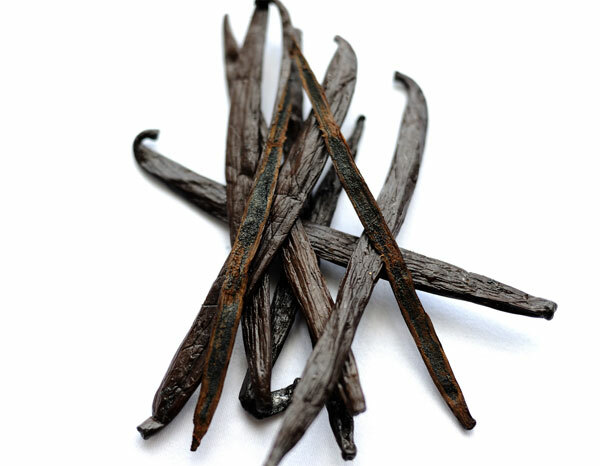 The vanilla essence is used for flavoring food items like ice creams, chocolates, cakes, bakery products etc. It is also widely used in liquors, medicines and perfumes. The vanilla pods may be used as such or can be used in the powdered or extracted form.